Below: C2 and C1 (the one who has autism spectrum disorder--ASD) bond over stuff animals. It makes my day when I see my two boys getting along so well, although they fight as much as you would expect brothers to do. C2, 7, often leads C1, 11, in play, usually using stuffed animals. C2 loves cats. C1 loves "froggies." We have a lot of stuffed frogs... and a lot of cats too!!! 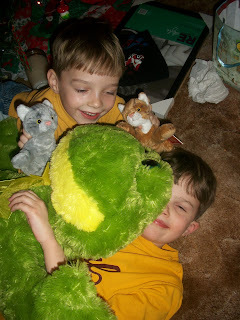 My oldest received the giant stuffed frog for Christmas from his paternal grandparents. My youngest received the two cats he is holding from his maternal aunt. Beyond bonding over the stuffed animals, my oldest has been known to hug and kiss his little brother and tell him he loves him without being prompted. We have to work on the appropriate times to do this because C2 gets embarrassed if C1 does this in front of other people. However, I'm grateful my guy is capable of displaying unprompted affection. I get the occasional "I love you" from him as well. It always seems like a miracle. I wonder if maybe that is because I have been telling him I love him every day since he was a baby. Who knows? I'd understand, though, if my guy was unable to say those three words or hug or kiss, as I know is the case with many people on the spectrum. After all love should be unconditional. Although I cannot speak for them, it's very likely that the person with ASD loves their family members despite being unable to display it in an outward manner. We can't assume they are incaple of having emotions because they are unable to display them. What a great post. I feel really blessed that my ASD little guy is very affectionate. He doesn't throw chairs at me anymore and can communicate. We understand each other so much better now that we get the ASD. For his affection I'm most grateful as my heart aches for those who don't get to appreciate that feedback. It doesn't always come when I want it to but when it does - it melts my heart. sometimes more than words are the best I love you's - my jeremy hugged and sat in your life- in the end he could say wuv u- the best thing to put me in cloud nine- but I already knew he loved me- I saw it in his eyes and his smile and his laugh- Brandon on the other hand says I love you more, I love you the most. lol good post julie. It's great to read the affection of love between brothers at an early age. This is a good sign. Now all you have to do is nurture that love. The boys look so cute. It takes time for kids too to understand us and to understand the people around them. They gradually learn to share and trust.